I have had every intention to blog at least every other day. I’ve always got something to say or ponder and this is a perfect avenue for me. Very cathartic! I seem to live in my van lately. I don’t like this season of life. I think if I can slow down for a while my body and mind will completely heal. I am supposed to be doing taxes right now, but I’m a bit carsick queasy right now. I’ll work on it shortly, maybe after a small protein snack? I attended my eldest son’s school sports banquet last night. Something Brother Clark “preached” about resonated with something God has already put in my heart. I felt like he had opened my bible study quiet time notebook and read it. It was cool, awesome, creepy, cool and a blessing. It confirmed to me that God really IS talking to me. I have a written journal for things I “hear” when am meditating on the word. I am slowly trying to declutter my home. For lent again I am doing the 40 bags in 40 days challenge. A forty day period in the spring (coinciding with the 40 days of Lent) where you focus on cleaning one area per day. In this one area you challenge yourself to declutter, simplify, decrapify, and get rid of things you don’t need. The goal is one bag a day but you can have more or less. The 2014 challenge officially goes from Wednesday, March 5th to Saturday, April 19th. Sundays are your day off. You can start it whenever you are finding this post, we’ll still be here to cheer you on! 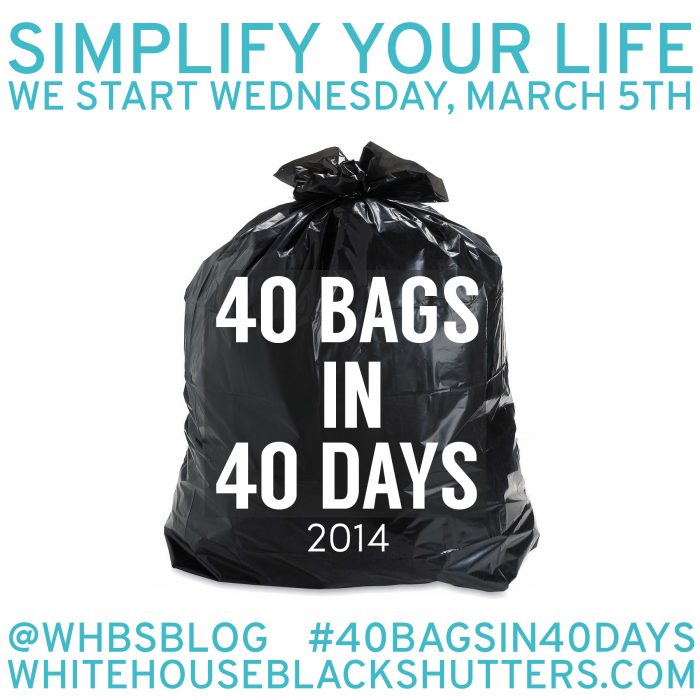 Also at http://www.whitehouseblackshutters.com/40-bags-in-40-days-2014/ you can find printouts to help you organize. I had already made my list and organized before finding it. I also have “sticky notes” in my computer to remind me and apps on my phone that I use to check off progress. I am very ill. I want God to completely heal me. I am asking for any readers to join me for prayer in that direction! I’m praying that my healthy diet will aid in healing me from inside out. I know I need rest. I’ve been reading recently, about God giving sweet peace and rest. People are asking about my weight loss. I am working on a post about that currently in draft. Next PostNext She Needs REST!